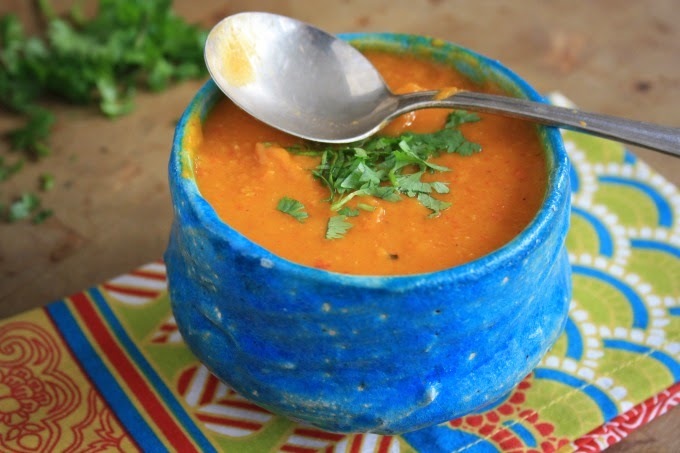 Winter squash and roasted red pepper lentil soup is smooth, flavourful and substantial, just right for damp winter days. What do you do when your kids announce they're sick of soup? From October to March I'd be happy to eat soup every day. 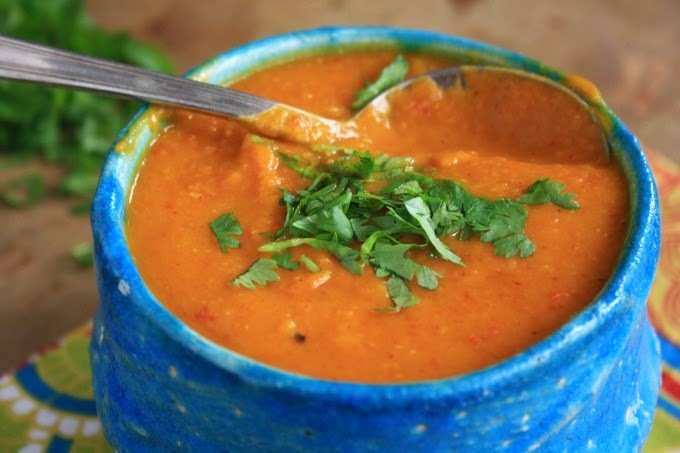 It's warming and satisfying, nourishing and a great way to fill up on vegetables and beans. And while I'd never get away with making it for supper seven days a week we do end up eating one soup or another at least twice a week. It was November when my kids announced they were sick of it, a mere month into my soup season. I'm not about to give in so I decided instead to figure out some new soup recipes with different flavours and textures. This soup is a recent success. Creamy thanks to the winter squash, it gets a lift from the roasted red peppers and curry paste and extra substance from red lentils. Finely chop the peeled squash or whir it in the food processor to pulverize it. In a large pot, over medium heat, saute the onion and garlic for a couple of minutes. Add the curry paste and continue to saute for another minute. Add chopped squash, grated carrot, vegetable broth and lentils. Stir and bring to a simmer. Boil gently, stirring often until the lentils are soft. Puree with an emersion blender or let cool slightly and puree in a blender or food processor. Stir in coconut milk and fish sauce. Season with salt to taste.